Every time a customer interacts with a financial services provider, it is an opportunity for the provider to create a better customer experience. Each employee and agent can play a role, whether through product design or implementation, systems development or maintenance, service delivery or leadership. Yet not everyone sees these opportunities or chooses to act on them. Businesses that want to increase financial inclusion, especially at scale, can do so by providing resources that make it easier and more attractive for all staff to understand and improve the customer experience, even those who don’t directly interact with customers. This is a lesson that JUMO, a financial technology company active in six markets in Africa and Pakistan, learned early. JUMO uses behavioral data such as mobile phone use to create a financial identity and credit rating for low-income individuals and enterprises, who can then access savings, loan and insurance products through a mobile interface. JUMO doesn’t employ loan officers, tellers or branch managers. Instead, it partners with mobile network operators and banks that use the JUMO platform to serve end consumers. JUMO primarily employs data scientists and engineers who have little or no contact with end customers. Yet, as explained in the short video below, the company’s design decisions shape customers’ experience on the platform. To grow the number of companies offering services on its platform, JUMO knew that all its employees needed to focus on providing a great experience for end-customers. Although it had put tools and processes in place to gather customer insights, feeding those insights into various areas of the business at speed proved challenging, especially within a rapidly scaling and increasingly distributed business model. Customer operating principles (COPs). JUMO’s customer intelligence unit worked with various parts of the business and consulted thought leaders like the Smart Campaign to define a set of customer operating principles to guide everyone’s work. For example, one principle is “Access and Inclusion.” One of the levers for this principle is proactive prevention of over-indebtedness (see image on right). “Jumonauts,” as JUMO calls its employees, were invited to probe the meaning and implications of the principles and encouraged to suggest actions that might be taken. Initiatives with the greatest potential to improve the customer experience were prioritized for implementation. Sometimes that meant making changes to the platform, but other times it meant tweaking a training process, adjusting the terms of a service-level agreement or altering a metric. Tools to identify customer pain points. JUMO invested in tools that made it easier for its data scientists, engineers and partners to identify customer friction points. Two of its most powerful tools have been the EPS scorecard and dashboard, which use several indicators to track performance in three dimensions of the customer experience: effort (E), persistency and promotion (P) and satisfaction (S). For instance, repeat customers are one indicator of persistency, while the number of contact center calls per thousand deposits or thousand loans disbursed is one indicator of effort. The dashboard gives JUMO and its partners a holistic view of customer engagement at a glance, and the rich data behind it can easily be mined to better understand a trend or friction point once it’s identified. Channels to learn about impact on customers. JUMO used new and existing communication channels to share the results of customer experience improvement activities, highlighting how different areas of the business contributed to the results. 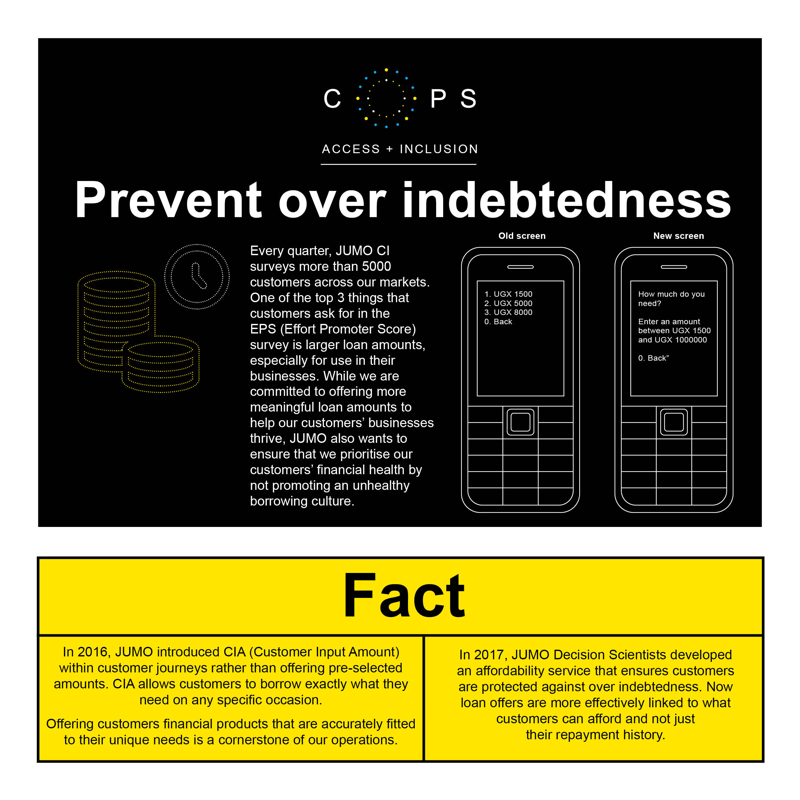 It also created infographic cards with “fun facts” that celebrated customer-centric successes, such as reducing the company’s terms and conditions from seven pages to just one. JUMO posted these cards on its internal Slack channel and on screens around the office. These feedback loops enabled employees to see the impact of customer-centric design changes and inspired them to seek out customer voices in their own projects. Today, JUMO teams don’t want to invest in new products without tapping customer insights; they budget for customer-focused research and data analytics. They’re building new solutions, designing refresher trainings and providing support materials that make it easier for partners to respond to their customers. These actions are increasing financial inclusion and fueling business growth. For example, JUMO saw an increase in female customers after it deployed strategies that made financial services more accessible to people with light digital footprints and adjusted its marketing based on insights into women’s engagement patterns. Overall, JUMO’s experience demonstrates that investments in employee empowerment don’t have to be sunk costs; they can generate value for customers, partners, employees and the business. Between March 2016 and April 2018, JUMO more than doubled the number of financial product brands offered on its platform by mobile network operators and banks while increasing its EPS score from 83.2 to 85.9 percent. In the past year, it has gone from serving 5 million people across six African countries and Pakistan to reaching more than 9 million. In some markets, as many as 80 percent of JUMO’s customers say its platform enabled them to interact with a bank for the first time. CGAP’s Employee and Agent Empowerment Toolkit offers guidance for motivating deeper engagement and strengthening employee and agent ability to deliver valuable customer experience. The accompanying Ideabook features a detailed case study on JUMO’s experience as well as that of seven other businesses and 23 practical tools and tips. Both are available on CGAP’s Customer-Centric Guide.